Is Your Thyroid Secretly Hurting You? Find Out in Minutes . . .
Have you recently been feeling ‘not quite right’? Do you struggle with losing weight or have unexplained fatigue or brain fog? The answer could be your thyroid! Take this online quiz to find out. Thyroid disorders have now been linked to 59 major diseases including heart disease, obesity, diabetes, and more.Your thyroid is a small, butterfly-shaped gland in your neck, weighing only about 1 ½ ounces. And while it may be small in size, many health experts consider your thyroid to be a master gland when it comes to controlling your body. Many doctors merely rely on drugs to mask symptoms of a “sluggish” thyroid. 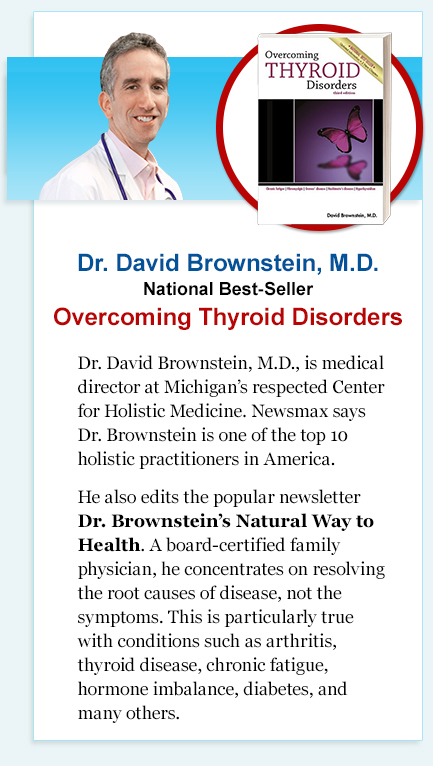 “Not so fast”, says Dr. David Brownstein, one of the nation’s leading experts on natural thyroid health. Dr. Brownstein says that countless people have been mistakenly told by their own doctor that their thyroid function is just fine. That’s because many doctors use a common – yet often misleading – test. Now Dr. Brownstein has created his own online thyroid health quiz – allowing you to easily assess your thyroid health risk in just a matter of minutes. Dr. Brownstein uses a similar test with his own patients. Have you recently experienced unusual weight gain or loss? Do you experience unexplained fatigue or loss of energy? Have you recently had sudden hair loss? How would you describe your stress level? Are you Intolerant to cold or hot environments? Do you often have feelings of ‘brain fog’ or difficulty concentrating? Do you suffer from unexplained, erratic mood swings? Do you often feel nervous and unable to concentrate? Do you have 'puffy eyes' or swelling under the eyes? Before We Compile Your Score, Tell Us About You: Do you tend to follow conventional medical advice or do you look for alternative and natural health approaches? Enter your email address below to receive your personalized results directly in your inbox. In addition to receiving your personalized test results, you'll also receive health alerts from Dr. David Brownstein and Newsmaxhealth.com. You can unsubscribe at any time. Privacy:We never share your email address with third parties.